OHM Pipe Tobacco is becoming a customer favorite and our best-selling brand. OHM is an all-natural, non-aromatic high quality tobacco blend that's manufactured with no added artificial preservatives. 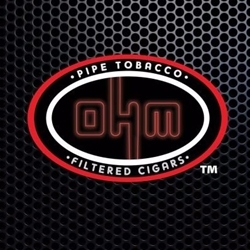 OHM Pipe Tobacco is made from perfectly ripened Virginia and Burley tobaccos that are air cured and infused with an essences that provides a fine draw and an even burn. Every OHM Pipe Tobacco flavor listed below produces a smooth, mild, distinctive taste and flavor, leaving behind an ambient scent that’s never overbearing. Truth be told, this amazingly simple yet distinctive tobacco brand has an attraction so strong, it can transform any novice smoker into the most experienced and devote follower. Smokers who love an excellent premium tobacco that can pack nice and firm inside their favorite smoking pipe, will love OHM Pipe Tobacco! Find out what we already know, try OHM’s unique flavors today! OHM Pipe Tobacco is manufactured and distributed nationwide by Inter-Continental Trading Inc., USA. Each pouch of OHM Pipe Tobacco are available at our online tobacco store in unique styles to choose from. Extra Smooth (Silver), Mint (Green), Natural (Yellow), Regular (Bold), Smooth (Blue), Smooth Mint (Light Green) and Turkish Blend (Red). Our online premium tobacco store offers great deals and inexpensive ways to save money on over-prices retail brands. OHM Pipe Tobacco can be the right choice for your money saving needs. Here at Smokers Discounts we’ve made it easy and affordable to buy pipe tobacco online. Call us for more details!